Our old-fashioned staircase has a window at the landing, and a storage area underneath. In order to access the storage, you have to open the door to the adjacent first floor laundry room. I love that little storage nook that’s cleverly concealed with a wall, but I also love storage under staircases that’s fully or partially exposed. I’m sharing 11 inspiring ideas from Houzz that might prompt you to re-think what you can do with your own stairway. You’ve probably all seen the staircase with a powder room tucked below. Although this isn’t really a storage concept, it does provide a great way to add an additional bathroom to your home. And as any realtor will tell you, an extra bathroom always adds to the value of your home. 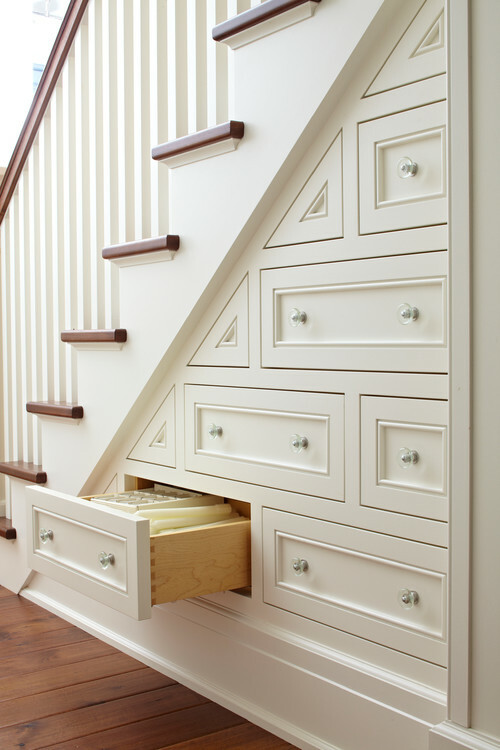 Drawers beneath a stairway located by the front door create storage space for hats, mittens, car keys, mail … you name it. 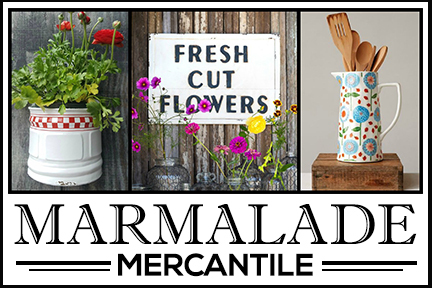 Anything you need to drop off when entering your home. What a great way to conceal important clutter. 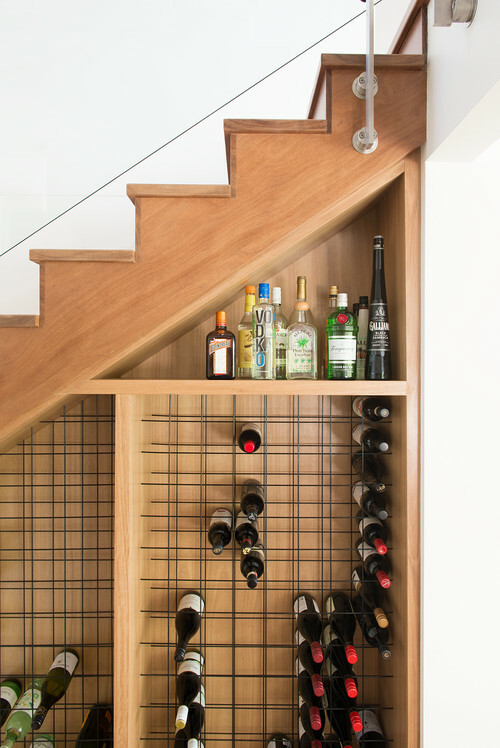 Here’s a fun idea for adding storage under staircases … a wine cellar! 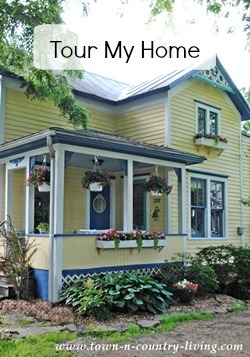 Maybe you’re a renter and aren’t allowed to construct something in your home. 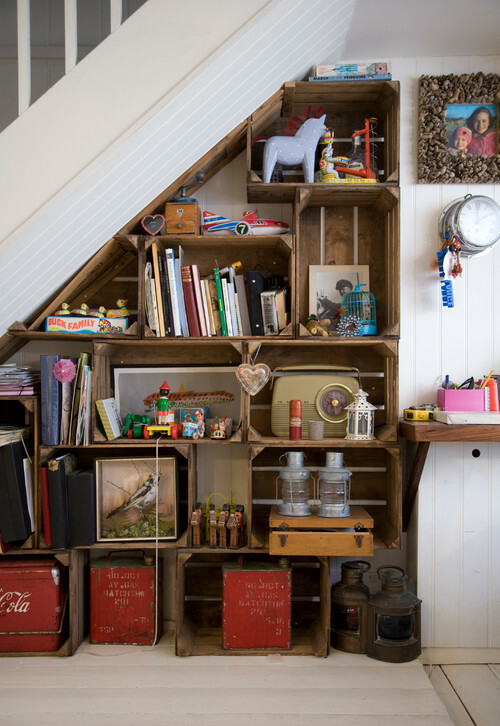 You can still enjoy ample storage under staircases by stacking old wooden crates as makeshift book shelves. My mother would think this looks messy, but I find it a bit charming and endearing. Can you ever have too much storage? I don’t think so. I’m always rearranging closets, hutches, even under-the-bed storage boxes to create more space. Organization however, is your best friend when it comes to storage. Right now I’m on a purging binge, removing items from closets and drawers that I no longer use. What’s the point of letting them occupy much-needed real estate? So I have this friend who has about 10 bikes. He was a semi-pro racer and all his cycles are stored in the basement. But one day his dream is to convince his wife to let him promote them to the main floors of their house and use them as decor. When I saw this idea for storage under staircases I immediately thought of him. He would love this! I think his wife might even be keen to it. 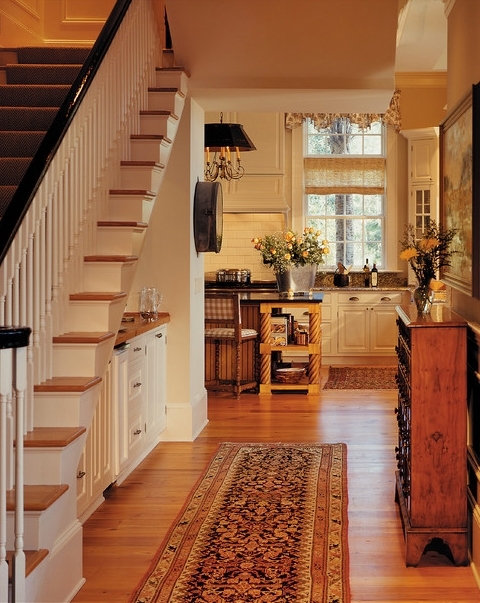 A genius idea is to tuck a butler’s pantry under a staircase located near the kitchen. Store bar ware and beverages in the cabinets beneath the bar area. 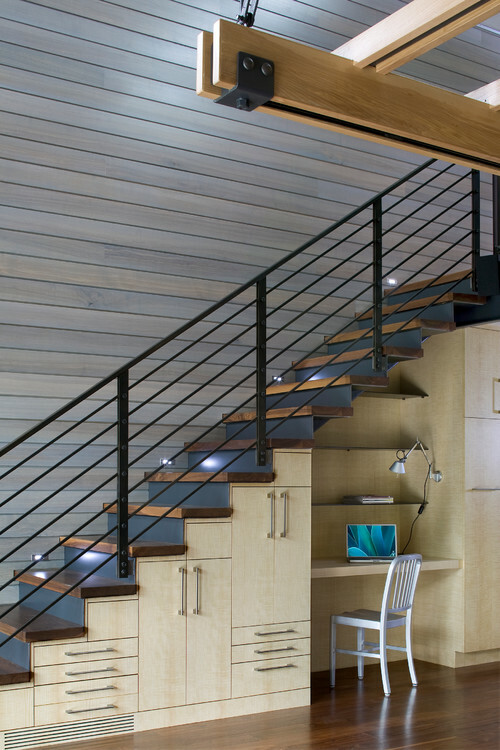 A contemporary stairway enjoys a built-in desk below. Drawers and doors provide storage space for office supplies, maybe even a printer. Who has a secret room under their staircase, and what kid wouldn’t love their own private playroom? This is a great idea for mom too, since toys can be easily stored here. Just shut the door and no one can see the mess! 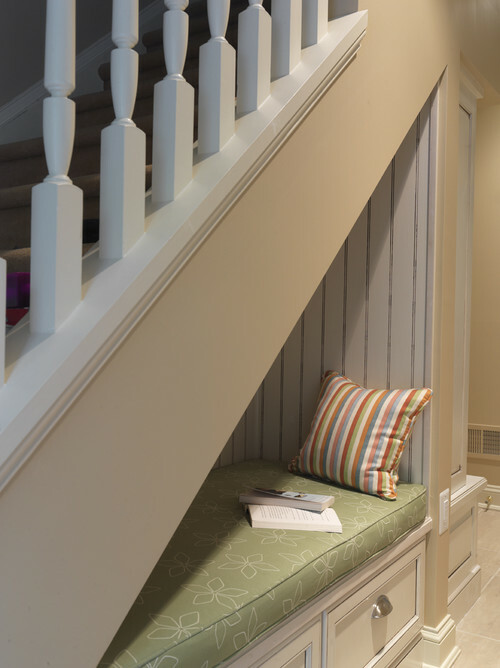 A little reading nook is a great idea to maximize the space under a stairway. Drawers underneath create storage for books and writing materials, and maybe even a blanket or two. 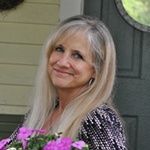 Photo by Jack’N Tool Box, Inc. 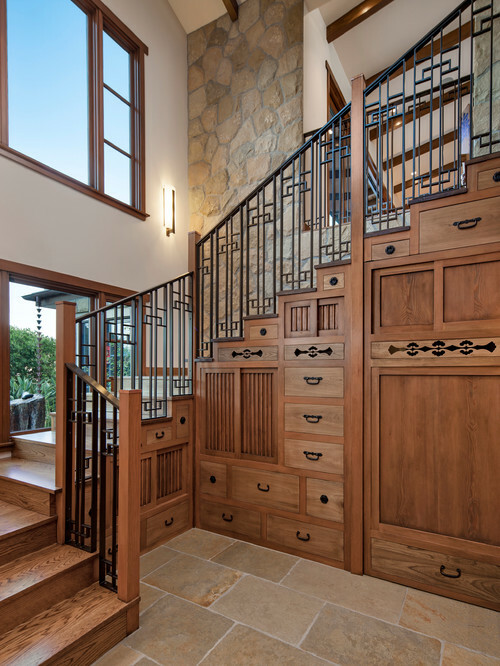 When it comes to storage under staircases, this example is probably the grand daddy of them all! 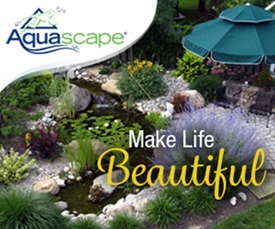 Not only is there oodles of storage capability, but the craftsmanship is pretty gorgeous. So tell me, what’s under your staircase? 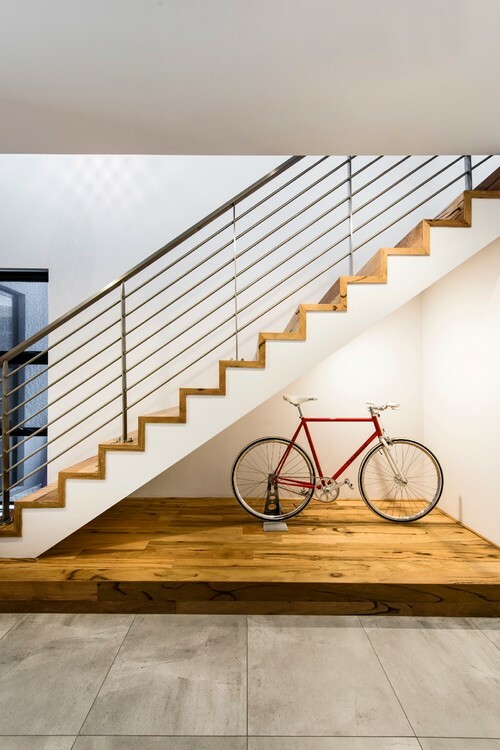 If your home is newer, chances are it’s the stairway to the basement. I hope you enjoyed this roundup of creative uses for space under the staircase! Wonderful ideas for staircases. Always good to use the spaces available.